I am getting excited for Valentine’s Day! This weekend I put together my kids Valentine’s Day Countdown Chain and also designed up these Ninjago Valentine’s for my boys! I designed two different versions and each version has two different font options! So, every little Ninjago lover out there should be able to find one they love! The first design I’m sharing has the words and a Ninjago character on it. 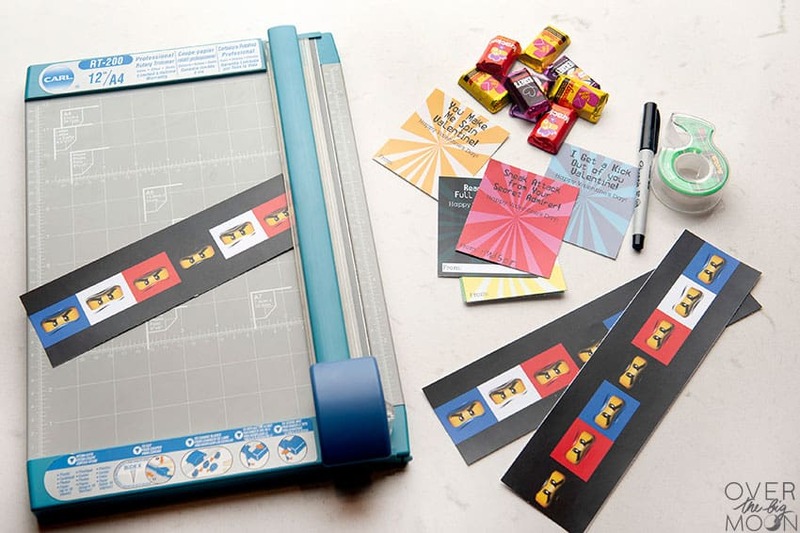 All you need to do is have your kid write their name at the bottom and then they can just tape it to a small item or candy! I have it available in 2 different fonts – one is a NINJA font and the other is a LEGO font! 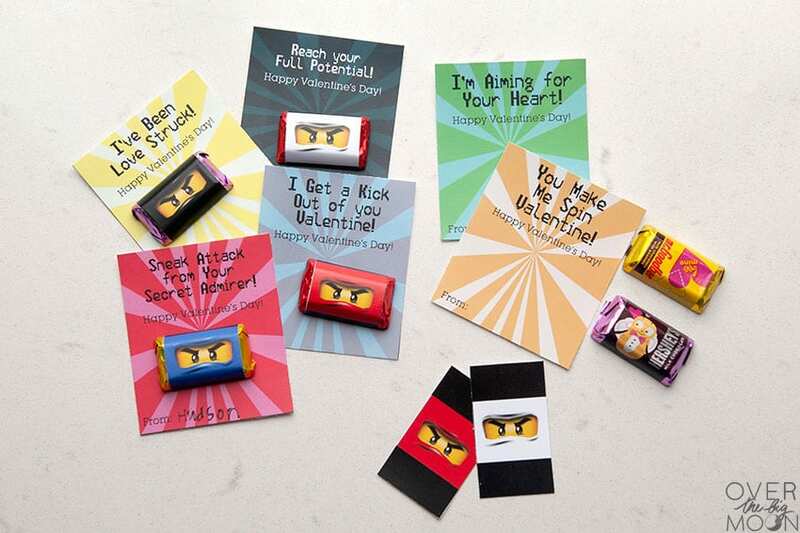 The second Ninjago Valentine I designed, includes a spot for a mini candy bar to go. I have designed a coordinating Ninjago Mini Candy Bar Wrapper that you can download below. 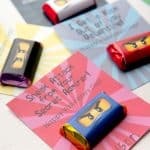 Just choose to download either the Blank Valentine Printable with the NINJA font or the LEGO font then download the mini candy bar wrappers. 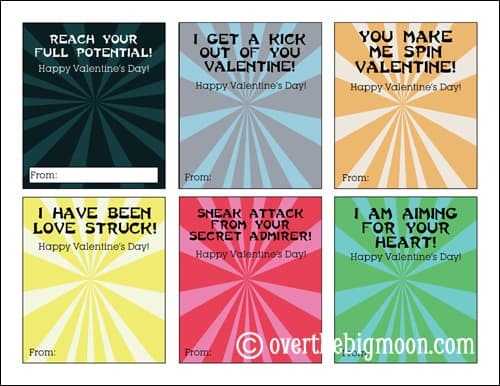 Print them out, cut the Ninjago Valentine’s and mini candy bar wrappers out. Wrap the mini candy bar wrapper around the candy and secure with tape. 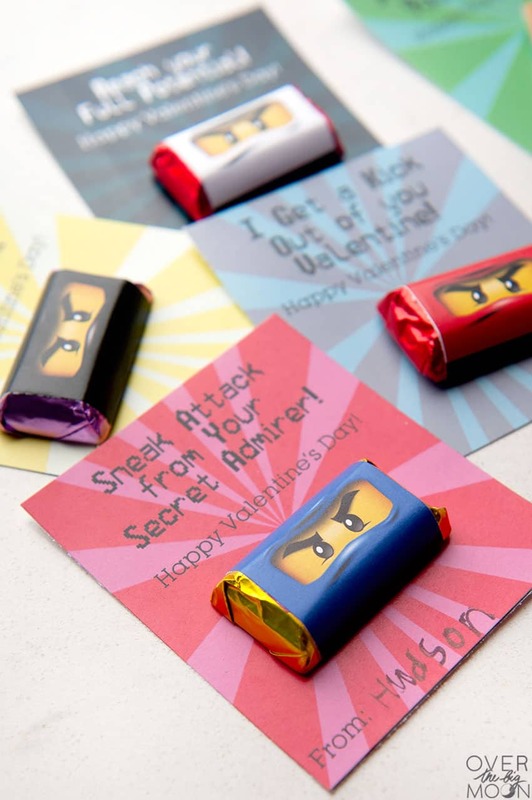 And then attach the mini candy bar to the printed Blank Valentine that doesn’t have a Ninjago character on it! People have really liked Lisa’s Minecraft Valentine’s (also available in Pink) with Candy Bar wrappers, so I thought I would do something similar! I really hope your little one enjoys this Valentine as much as my kiddos do! Happy Valentine’s Day! And if your little Ninja loves Ninjago check out our free full party pack! *This post originally published in January 2014 and has been updated. Don’t forget to pin this post for later! Thanks friend! Yey! I’m so glad he loves them! Thanks so much for these! 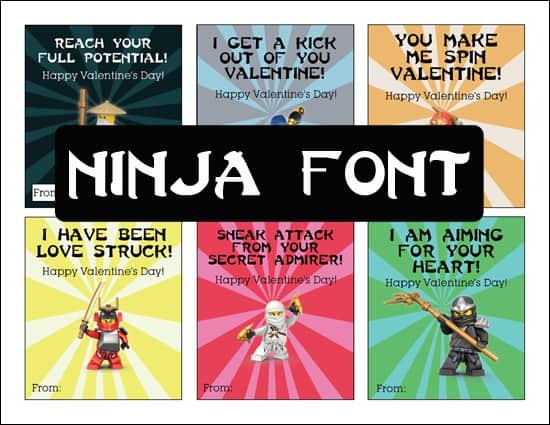 My 5 year old son is a huge Ninjago fan and will love these for Valentine’s Day! Otherwise I’d be making from scratch…much appreciated! These are amazing! My kid is freaking out. Many thanks!!!! I have tried downloading the valentines several times on different browsers and even on different computers. 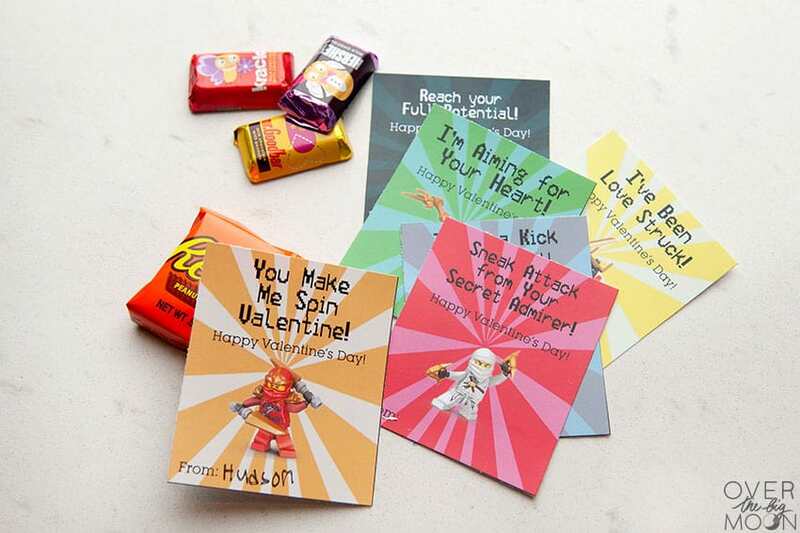 I had no problem downloading the Ninjago candy wrappers or the Mine Craft Valentines and candy wrappers, so there has to be something wrong with the links for the Ninjago Valentines. these are so great. I cant seem to download the pdf files for the valentines though. They just open up on a new tab. These are perfect and even better than buying them at the store. Thanks so much for making them and sharing. My five year old loves them. Thank you!!!!!! This makes for one happy 5 year old! Andrea- I would try downloading them in a different browser. If you’re still having problems, shoot me an email at pam@overthebigmoon.com with what files you are needing and I’ll email them over to you! Did you download them using the link? 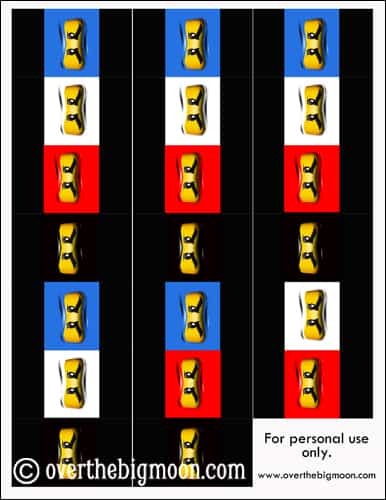 If you are trying to print off the picture they will be really small. If you are still having problems let us know. These are so adorable!! Totally sharing these with all my girlfriend’s whose little ones are Ninjango obsessed! My nephews would flip for these. Fantastic! THANK YOU! I have a 9-year-old who is going probably cry, because he loves Ninjago so much!! Thank you so much for sharing! So glad! I really hope he enjoy them! Thanks for the comment! Thank you for sharing so generously! 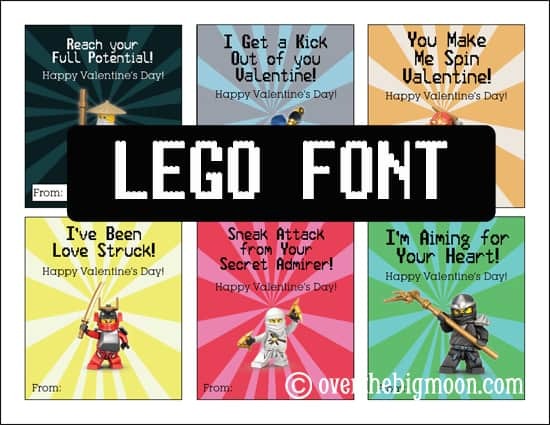 My four year old was insisting adamantly that it had to be Ninjago valentines this year and nothing was swaying him!